There are tons of microphones out there ranging in widely in quality and price. To get the best sound, you need to get the right microphone for right the situation. When you want to do a stereo recording, or create a stereo sound, you will need a stereo microphone. What is a stereo recording? A stereo recording gives a more complex sound than a mono recording. Stereo recordings make you feel like you are at the scene. Stereo mics produce a stronger audio signal and are more sensitive and responsive than other types of mics. They are great for recording the sounds of acoustic instruments since they pick up subtle sounds. Some stereo mics have two separate capsules mounted on one mic body to eliminate the need for two mics, while producing the same effect as using two separate microphones. This setup is easier and faster. The Nikon 27045 ME-1 is designed for use with DSLR cameras that have a 3.5mm mic jack. Make sure your camera has a 3.5mm stereo mini-pin jack before purchasing this stereo mic. This is a great choice for those who want to improve the quality of their camera’s built-in mic and reduce zoom and focus noise. Fitted with a vibration-reduction system, it reduces noise from the camera’s auto-focus system. This feature helps to produce a clear, crisp sound. The cable-stop holds the cable in place to prevent noise being recorded from the cable moving around. The microphone is fitted on a rubberized mount to reduce sounds from vibration. The included wind screen reduces wind noise considerably which is great to use when outdoors. Also included is a soft carrying case and an instruction sheet to help you learn how to use it. The attached 3.5mm cable is long enough to allow you to move the microphone further away from the camera using an accessory arm. The Nikon 27045 ME- is easy to pack along with your camera since it doesn’t take up much space and it is also pretty light. It conveniently comes with its own carrying case. The mount has a locking screw that can be loosened to tilt the microphone up or down. You can use this feature to direct the microphone to an audio source that may be a bit below or above the camera. The mic is fitted with a rotary dial so that you can adjust the low-cut filter on and off. The low-cut filter cuts out low frequency noise from wind and other sources. Featuring a clip style design, you can clip the Sony ECMCS3 to your clothes for hands-free recording. To use it outdoors, you can mount it on your helmet if you are riding a bike or doing some other outdoor activity. The microphone also rotates so that you can place it wherever you want on your clothing. It has a frequency response of 50Hz-15Hz and a sensitivity of -38dB. The omnidirectional design makes it ideal for those who want to record outside and want a natural, airy sound. This mic works great for recording hiking trips. It captures sounds from all directions to provide a true recording, picking up all nearby noises.Since it is so small and light in size, it is also great to use indoors as well, for meetings or interviews. Its sleek design makes it appropriate to use in business settings. You can also use it for online gaming or video calling. When using for online gaming, however, it will pick up some sounds from your keyboard and mouse because of its omnidirectional design. It will also pick up some room noise, so if that will be an issue for you, you may want to purchase some audio treatment to dampen the reverb.The Sony ECMCS3 is compatible with digital voice recorders, desktops, and laptops. It comes with a 3.5mm cable to connect your devices.This microphone provides great sound quality at a budget-friendly price. It offers crisp audio quality and does not rely on batteries. All you have to do is plug it in to get started. 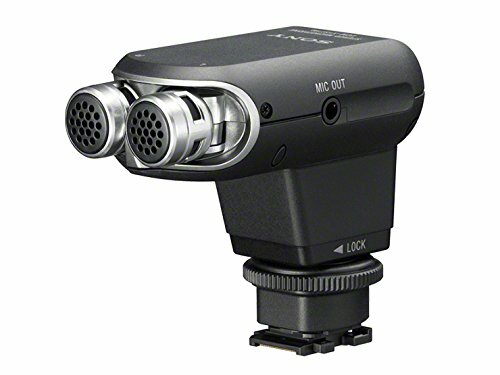 The Sony ECM-XYST1M microphone is compatible with handyman camcorders, cyber-shot cameras, alpha cameras, and any other camera that has a Sony Multi Interface Shoe. When you use it with a camera that has a Sony Multi Interface Shoe, the audio is passed directly to your camera so you don’t need any additional cable. 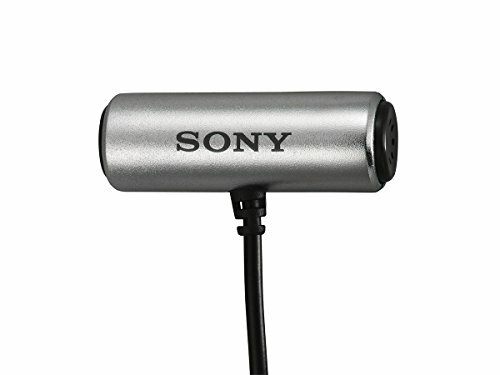 You can still use this mic with a camera that does not have the Sony Multi Interface Shoe by connecting the microphone to the mic input jack on your camera. You will just need a stereo mini-jack cable. You can adjust the recording range on this mic from 0 degrees to 120 degrees. This allows you to fine-tune your recording according to the setting. The Sony ECM-XYST1M provides high quality sound recording with a wide frequency band to produce the best audio. This budget-friendly option provides professional quality sound and operation. To improve the audio even more, an included wind screen can be used to reduce wind noises and give you a clear, crisp audio. Not only does this mic provide a professional sound quality, it also has a sleek design to match to give a professional look and feel. Included in the purchase is an audio mini-jack connection cable, windscreen, carrying pouch, and a 1-year limited warranty. The SSH-6 includes a super-directional microphone for picking up sound in the center. It also has a bidirectional side mic to pick up sounds from the left and right sides of the mic. 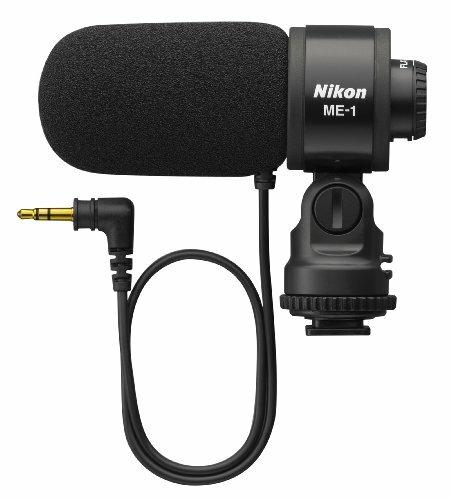 This mic is compatible with the Zoom H5 and H6 Handy Recorders and the Q8 Handy Video Recorder. You can capture dialogue with the center mic, and then blend in just the right amount of environmental sound captured by the side mics in post-production. This allows you to capture a realistic sound with the right balance of ambient sound. Even if you record with too much environmental sound, you can adjust it during post production. The 5-volt preamp minimizes distortion even when using at high volumes. The monophonic design allows you to record dialogue at a distance without having a large, obvious mic at the scene. It is great to use for film and video shoots as well as electronic newsgathering applications. The included fuzzy windscreen reduces any wind noise. The SSH-6 is one of several Zoom capsules which are interchangeable so that you always have the right mic when you are recording. The capsules snap on in seconds so that you can easily swap them when needed. 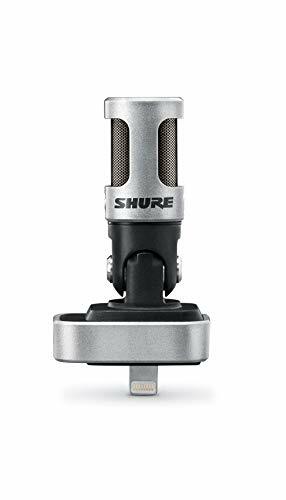 Compatible with all iOS devices that are equipped with a Lightning connector, this stereo condenser microphone provides superior audio quality and clarity. The five DSP preset modes allow you to get the best audio depending on what you are recording. The 5 settings are: speech, singing, flat, acoustic, instrument, loud. The matched cardioid and bi-directional 1 cm cartridges provide the best audio experience. Featuring a mid-side architecture, the Shure MV88 produces a phase-perfect, clear stereo image. It automatically adjusts EQ, compression, and limited. The innovative hinge/rotation design allows for flexibility in recording angles including video applications. With an all-metal construction, this mic is built to withstand the most demanding recording conditions. To improve your recordings, you can download the free ShurePlu﻿﻿s MOTIV﻿ recording app which features 24 bit/48kHz wav recording, control over DSP mode selection, mic gain, wind reduction, stereo width, raw mid-side adjustments, capsule selection, 5-band EQ, left-right swap, and compression/limiting. The included windscreen allows you to control the sound picked up by the wind. The MV88 also comes with a headphone adapter cable and carrying case. It has been designed for mobile recording, podcasting, video blogging, mobile journalism/field recording, and live streaming video. As the name suggests, large-diaphragm microphones are larger in size than the other types. They usually have a diaphragm of ¾ of an inch to an inch in diameter. They are very sensitive, making them ideal for recording voices and many different kinds of instruments. Large-diaphragm mics are often used as the main microphones in recording studios. Because they are large in size, they are not suitable to use when you are limited on space. They have to be suspended to isolate them from external vibrations. This makes them unsuitable for some situations, such as for use with a drum kit. Large-diaphragm mics come in a wide range of prices, from affordable to very expensive. You don’t necessarily need to go for the most expensive option since some budget-friendly options have a similar design to the more expensive ones. Small-diaphragm mics are usually a ½ inch or less in diameter and they are good for reproducing high-frequency sounds, or sounds that change quickly. They require phantom power or a battery to operate. Side-address microphones also have a larger diaphragm which is covered by a windscreen for noise reduction. The are meant to be positioned so that they are aimed toward the side at a 90-degree angle. This makes it appear as if the person using it is speaking or singing into the side of it. Dual-diaphragm mics are designed similarly to side-address mics. The difference is that they have two diaphragms that are pointed in opposite directions to pick up surrounding sounds. They are also great for recording multiple voices at once. Dual-diaphragm mics make it easier to balance two sound sources at the same time. They provide a better recording than when using 2 separate mics. ​Directionality. Microphones are either omnidirectional, bidirectional, cardioid, or have variable directionality. Omnidirectional mics pick up sound from all directions. This can be good if you want a surround sound type audio. However, omnidirectional mics can also pick up unwanted background noise. Cardioid mics pick up sound in a heart-shaped pattern. They pick up the majority of the sound from the front of the mic, and capture a little sound from the sides. They are usually used for recording music. Bidirectional mics pick up sound from opposite sides of the mic. This type is popular for podcasting. Mics with variable directionality can switch between different types of directionality, offering a lot of flexibility. Frequency response. You will usually always see a frequency response number in the description of microphones. The frequency response number simply tells you the range of frequencies the mic can detect. Pay attention to the kind of frequencies that the mic can detect, as this is more important than the number itself. You want to make sure that it will pick up the frequencies of whatever you want to record. If you want to record vocals and a guitar, for instance, you should look for a mic that can pick up mid-range and high frequencies. For recording bass, a mic that is good at picking up low frequencies is the best choice. Durability. If you will be using the mic outdoors, attached to a camera for instance, you will want to make sure it is durable enough to withstand a light amount of abuse. Type of connection. Be sure to check out what types of equipment the mic is compatible with to ensure you can use it with the equipment you have. If you want to make a high quality recording, purchasing a stereo microphone is a must. They have a wide range of uses including: vocal and instrument recording, journalism, video blogging, gaming, and more. Stereo mics produce the sound of a stereo with a microphone. You can expect a clear, crisp, realistic sound which makes for the best recordings.